German trade magazine readers vote Mercedes-Benz as their favoured brand. Mercedes-Benz has been awarded the "Readers Choice for Best Commercial Vehicles and Brands 2014" by over 7000 readers from a variety of German trade magazines. Aside from the general award, two Mercedes-Benz trucks won individual category awards. 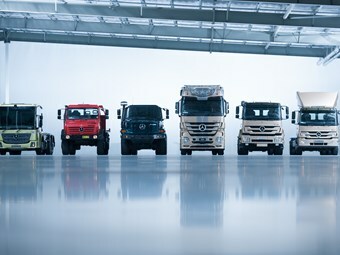 The Mercedes-Benz Actros won in the long distance category, whilst the Atego took out the medium duty category. "This is a fantastic result for Mercedes-Benz trucks and further cements our position as a worldwide leader in truck technology, safety, economy and comfort," says Mercedes-Benz truck and bus general manager Justin Whitford. Other award winners include ZF, who placed first in the commercial vehicle transmission and retarder categories.